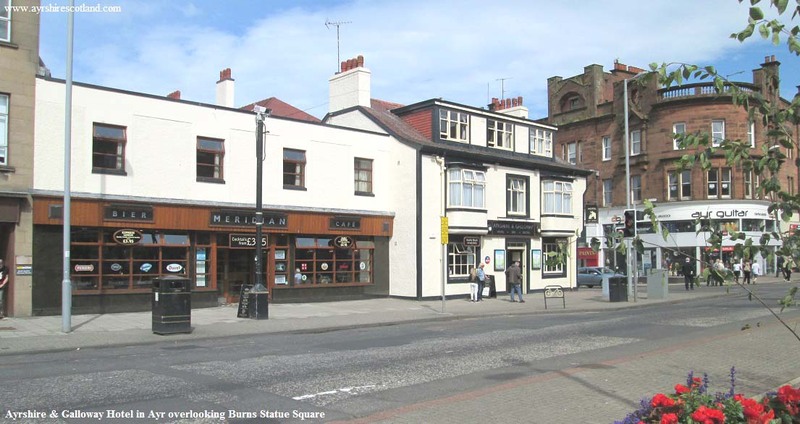 All the hotels in Ayr with websites, images, phone numbers and links to maps and reviews. Fairfield House Hotel & Restaurant. VS 4 Star, 0.4 miles southwest of Ayr town centre on Fairfield Road. A 44-room hotel with a picturesque seafront location with views across the waters of the sea to the Isle of Arran. Tel: 01292 267 461. Western House Hotel & Restaurant. VS 4 Star, 0.7 miles northeast of Ayr town centre in the grounds of Ayr Racecourse. A popular restaurant and cosy bar lounge. Tel: 01292 294 990. Arrandale Hotel. SC 3 Star, 0.3 miles southwest of Ayr town centre on Cassillis Street. Renowned for comfort and individuality with nine beautifully presented ensuite bedrooms, and an elegant guest lounge. Tel: 01292 289 959. Ayrshire & Galloway Hotel & Restaurant. SC 3 Star, in Ayr town centre on Killoch Place overlooking Burns Statue Square. In the heart of Ayr's bustling town centre close to all amenities with car parking free for our guest. Tel: 01292 262 626. The Fox and Willow Hotel & Restaurant. SC 3 Star, 0.4 miles south of Ayr town centre on Carrick Road. Formerly the Carrick Lodge, ideal for a relaxing holiday, weekend break, memorable meal, or looking a special group event. Tel: 01292 262 846. Enterkine House Hotel & Restaurant. VS 3 Star, 5 miles east of Ayr off the B742. A country house hotel in the heart of Ayrshire originally as a private residence in the late 1930s, now a popular hotel and restaurant. Tel: 01292 520 580. Horizon Hotel & Restaurant. SC 3 Star, 0.5 miles from Ayr town centre on the Esplanade facing directly onto the beach. 1st Class ensuite and budget accommodation with each room having colour TV, tea/coffee making facilities, hairdryer, clock radio. Tel: 01292 264 384. Hotel Kylestrome Bar & Grill. SC 3 Star, recently refurbished, in Ayr town centre on Miller Road. A former Victorian townhouse, the perfect base for a family holiday on the beautiful Ayrshire coast., only a short stroll from the promenade and beach. Tel: 01292 262 474. Mercure Ayr (former Ramada Jarvis) & Restaurant. SC 3 Star, in Ayr town centre. Close to Ayr train station and only 5 miles from Prestwick International Airport with magnificent views of the Isle of Arran and Mull of Kintyre. Tel: 0844 815 9005. Premier Inn Ayr A77/Racecourse. SC 3 Star, situated 2.5 miles northeast of Ayr town centre on Wheatpark Place by the Whitletts roundabout, just off the A77. Everything youd expect, incredibly comfy beds and an onsite restaurant. Tel: 0871 527 9416. Savoy Park Hotel & Restaurant. VS 3 Star, 0.5 miles south of Ayr town centre on Racecourse Road. Only minutes walk from the town centre and train station and a short stroll along tree lined avenues leads to Ayr's seafront. Tel: 01292 266 112. St Andrews Hotel. SC 2 Star, 1.5 miles north of Ayr town centre on Prestwick Road. Situated on the north side of river Ayr between the town centre and Prestwick Airport. A small friendly hotel with 7 bedrooms, popular with parties of golfers or race goers. Tel: 01292 263 211. Brig o Doon House Hotel & Restaurant. VS 5 Star, 2.5 miles south of Ayr town centre in the Alloway district. Situated in an exceptionally scenic area, one of the top wedding spots in Scotland. Tel: 01292 442 466. Ellisland Hotel & Restaurant. VS 5 Star, 0.5 miles south of Ayr town centre on Racecourse Road. An early 1900’s house surrounded by mature trees and immaculate grounds, minutes from the town centre, esplanade, and many attractions such as the Burns Heritage Park. Tel: 01292 260 111. Abbotsford Hotel & Restaurant. SC 3 Star, 0.7 miles south of Ayr town centre on Corsehill Road by Belleisle & Seafield Golf Courses. A family-run hotel 5 minutes walk from Ayr town centre and the beach. Tel: 01292 261 506. Website has special offers. Chestnuts Hotel & Restaurant. SC 3 Star, 0.8 miles southwest of Ayr town centre on Racecourse Road with views over Seafield playing fields and golf coarse. The south end of Ayr’s beach with an area to deploy small sailboats and wind surfing equipment is only a few hundred yards from the hotel. Tel: 01292 264 393. Glenpark Hotel & Restaurant. SC 2 Star, 0.3 miles south of Ayr town centre on Racecourse Road. A modern hotel offering guests and non-residents the warmest of welcomes, exceptional value hospitality. Tel: 01292 263 891. Travelodge Ayr. SC Budget, situated 2.5 miles northeast of Ayr town centre on Highfield Drive by the Whitletts roundabout, just off the A77. There are no food and beverage facilities within the hotel but a Frankie & Benny's restuarant is next door. Tel: 0871 984 6321. Belleisle House Hotel - Re-Opening 2018?. Tel: 01292 442 331. Tip: use Home and End keys on keyboard to go to top or bottom of these large pages.